Many people wonder if a vegetarian or vegan diet might be appropriate for their animal friends. Fortunately, your dogs can be vegetarians! 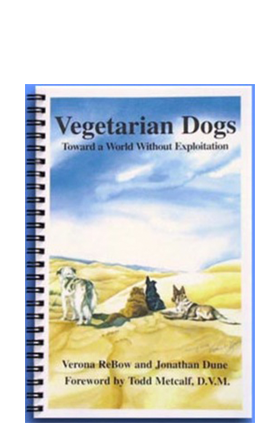 Vegetarian Dogs provides answers and gives directions to easily purchase or prepare a healthy meal. The book will teach you about canine nutrition, ethics, exercise, and healthcare. Equally important, the relationship between dogs and people is nourished and enriched through the beautiful images and related stories. There is no scientifically known reason why dogs cannot live full, healthy lives on a vegan diet. Furthermore, a homemade or commercial vegetarian food can avoid the potentially detrimental health effects of many meat-based commercial foods.